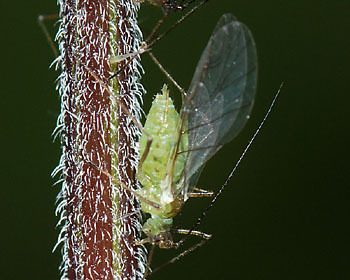 Microlophium are large spindle-shaped aphids, the adult viviparae of which may be winged or wingless. The antennae are much longer than the body length. The antennal tubercles are smooth, with the inner faces divergent. The siphunculi are long, tapering with a large flange. The body length of apterae is usually more than 3 mm. There are only four species in the Microlophium genus, living mostly on nettles (Urticaceae). They have a sexual stage in the life cycle, overwintering as eggs. They are not attended by ants, unlike the other common species on nettles (Aphis urticata) which is nearly always ant-attended. 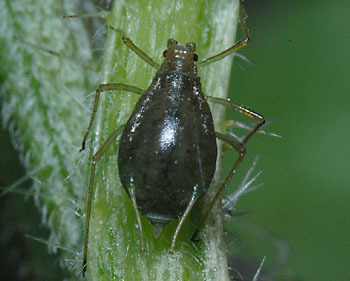 Microlophium carnosum is a large spindle-shaped aphid with an adult body length of 3.1-4.3 mm. Apterae (see first picture below) are various shades of green, pink or reddish purple. The antennae are curved and much longer than the full body length. The antennal tubercles are smooth, with the inner faces divergent. Microlophium carnosum siphunculi are long and tapering with flared apices, 2.3 to 3.1 times the length of the cauda. Common nettle aphid alates (see second picture above) have dark marginal sclerites but only faint spino-pleural markings. There is a sexual stage in the life cycle and there is no host alternation. Common nettle aphids live on stems and leaves of common nettle (Urtica dioica). Microlophium carnosum is generally common and often abundant throughout Europe and Asia east to Mongolia, Africa & North America. It is not ant-attended. Blackman, R.L. & Eastop, V.F. (2006). Aphids on the world's herbaceous plants and shrubs. Vols 1 and 2. John Wiley & Sons.